Dittmar was born in Illinois and moved to Virginia at the age of six when her father worked for President John F. Kennedy. She has lived in the Scottsville District for 15 years. Dittmar was president of the Charlottesville Regional Chamber of Commerce from 1992 to 2000. In 2005, she founded the Positive Solutions Group, a Charlottesville mediation firm. Dittmar is a Virginia Supreme Court certified mediator and serves as court coordinator for the courts of the City of Charlottesville, Albemarle County, Fluvanna County, Greene County, and Louisa County. Dittmar's mother, Virginia DeSimone, was the state president of the League of Women Voters. DeSimone was 83 as of 2013. Dittmar earned a degree in economics from the University of Virginia. She was also enrolled in the executive program at the Darden School of Business. Dittmar became chair of the Albemarle County Supervisors on January 8, 2014. Dittmar has decided to not seek election to a second term. She announced in September 2015 that she would seek the Democratic nomination for the 5th Congressional District seat held by Robert Hurt. Dittmar raised $77,600 in its first two weeks of fund-raising according to a report filed with the Federal Election Commission. Dittmar faced Cynthia Burket in the November 5, 2013 special election. She has raised $26,043 in campaign funds through August 31, 2013. She won election to the Scottsville Magisterial District seat on the Albemarle Board of Supervisors on November 5, 2013. She was sworn in on November 11, 2013. ↑ 1.0 1.1 Web. Democrats officially pick Dittmar to run in 5th District, Alex Rohr, Daily Progress, World Media Enterprises, May 7, 2016, retrieved May 9, 2016. ↑ Web. 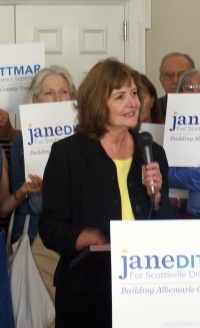 Dittmar launches campaign for Albemarle Board of Supervisors, Claudia Elzey, Charlottesville Tomorrow, 7 Aug 2013, retrieved 8 Aug 2013. ↑ 3.0 3.1 Web. Meeting: Conflict Resolution, Charlottesville SHRM, 9 Apr 2013, retrieved 2 Aug 2013. ↑ Web. About Our Firm, Positive Solutions Group, LLC, retrieved 2 Aug 2013. ↑ Web. Out of the gate: Glenmore fields supe candidates, Lisa Provence, The Hook, Better Publications LLC, 7 Aug 2013, retrieved 8 Aug 2013. Print. 8 Aug 2013 . ↑ 6.0 6.1 Web. Democrat to announce for Scottsville special election, Sean Tubbs, Charlottesville Tomorrow, 1 Aug 2013, retrieved 2 Aug 2013. ↑ Web. Dittmar will not seek second term as Albemarle Supervisor, Sean Tubbs, Charlottesville Tomorrow, April 30, 2015, retrieved May 5, 2015. This page was last edited on 9 May 2016, at 09:09.